NOTES: Interestingly, Claymore is no more rare or difficult to find than any of the other 5 members of the boxed Special Mission Brazil team from 1986. However, you'll have to pay well for Claymore because he is the most popular of the group. Claymore was the only member of the Brazil team that was an original character. This is the only version of Claymore ever released. Claymore's helmet is the same as 1985 Footloose's helmet but is all green. 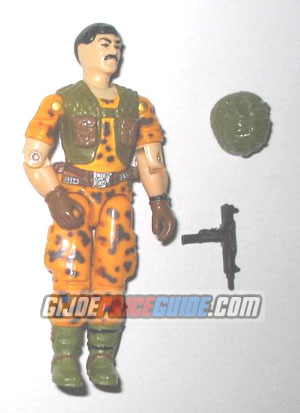 His gun came with several different figures including 1985 Snake Eyes.